Fly Like A ...... Bighorn? You run into some pretty neat stuff while heading to the field. Sometimes it's the high point of the day. Take this image for instance. It was recorded on film. Ah, the good old (if not less convenient) days of photography. I was driving through the Gallatin Canyon. A bunch of bighorn sheep were milling along the side of the road. I found a nearby turnout and pulled over. Sheep were busy grazing, some were in the river. Eventually, it looked like they wanted to cross the road. One ewe, then another. Up and over the barrier. Maybe the grass was greener. Maybe they just wanted to live dangerously and dodge traffic. It's a tough way to make a living. 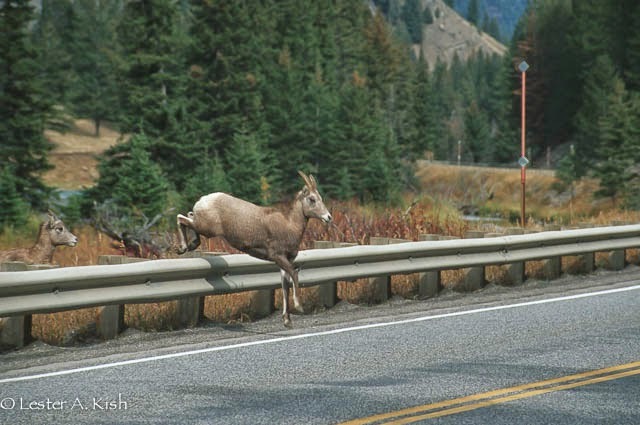 Hi Billl, while we're not overrun by bighorns, they can be viewed easily in a few locales around the state. Montana Fish, Wildlife and Parks indicates that there are some 5000 sheep in the state. They exist as 45 distinct populations. I've seen bighorns only once, on a mountaintop near Yellowstone, but never close up like the one you caught a photo of in mid-air. That image could be on a postcard promoting wild Montana! Or maybe a postcard promoting the not so wild roadside accessible fauna of Montana! Thanks Walt. Really amazing shot you have there. Thank you so much for sharing. More than welcome Atlas. Nice stuff on your blogs as well. You live in an awesome area Les.. Yes Mike, it sure is a neat place. Parts of your state of Maine are pretty nice too.